Welcome to the Fresh Air Life - WALKFIT program. At Fresh Air Life we believe that every step counts in our non-competitive, multi- generational outdoor health and wellness model. Jennifer Hewlett - the founder of Fresh Air Life understands that walking is the foundation of movement. After researching Urban Poles, Jennifer immediately made the Walkfit connection to Fresh Air Life. At Fresh AIr Life we " Walk for Life" and "Hike for Health" as these two programs are the foundation of Fresh Air Life - and provide a foundation for ALL women to gain strength - stamina - confidence - balance - core development and correct posture when we are moving together on the trails. The Fresh Air Life - WALKFIT programs are offered 4 times a week both in the morning and evening to provide an opportunity for ALL women to feel the fresh air magic as we "Walk for Life" together. 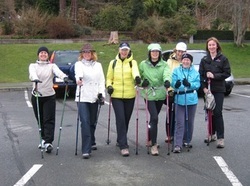 Offers a great video introduction to our foundation program, WalkFit. Check it out! BODYBALLFIT/COREFIT program is a wonderful way to get on the Ball and work on your core strength - balance with your bodyball and resistance bands during the fall and summer terms. 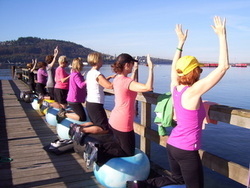 Jenn offers this unique program every Wednesday morning at 9:15am on the water at various North Shore locations during our fall and summer terms. If you are looking to add some creative ideas to your outdoor core workout - this class is a must.